I visited the exhibition at Kew on the first Sunday after it opened. There are 12 sites, displaying the pieces, dotted around the Gardens and I’d advise picking up a map from the ticket office rather than serendipitously stumbling upon them as I did. The landscape of Kew Garden provides the perfect canvas for Chihuly’s work. The surrounding foliage both compliments and contrasts with Chihuly’s unique art installations. Some works subtly integrate, embedding themselves in the substrate whilst others hover, appearing otherworldly. 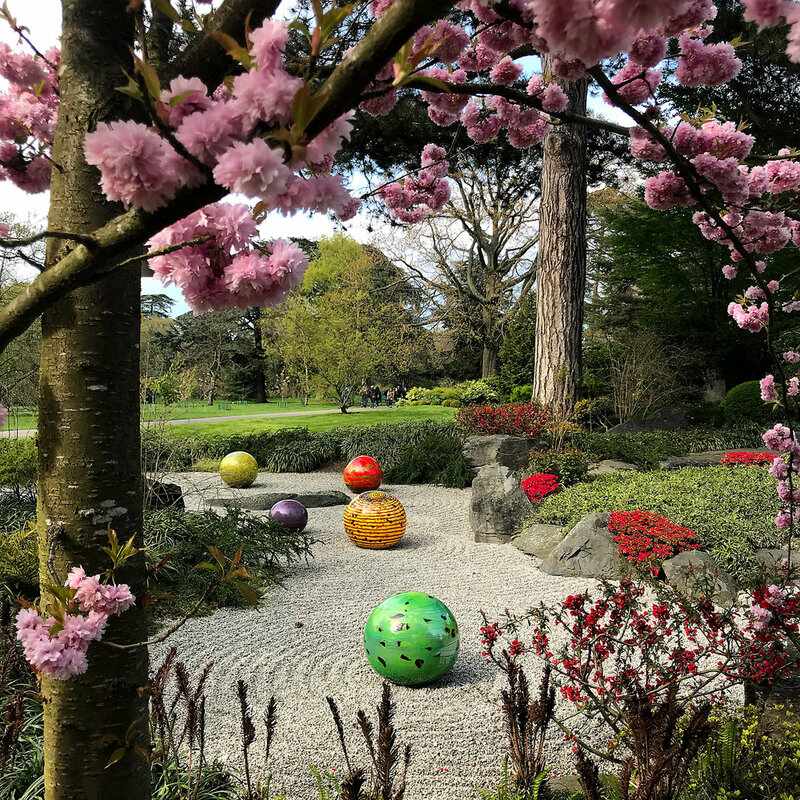 The works culminate in the newly restored temperate house, drawing visitors in their droves, down the cherry blossom pathway, towards the entrance. It has been 13 years since Kew last hosted Chihuly. 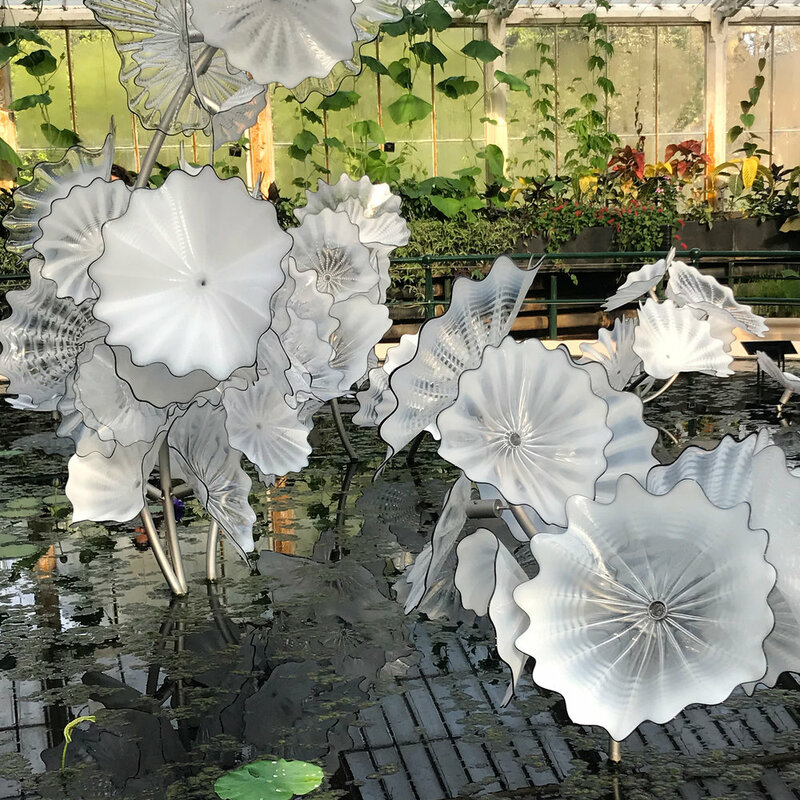 For me, the larger scale works provide the impact and excitement that usually entices me towards Chihuly's work however a selection of his more delicate works and expressive drawings are also on exhibition at Shirley Sherwood Gallery of Botanical Art within the gardens. 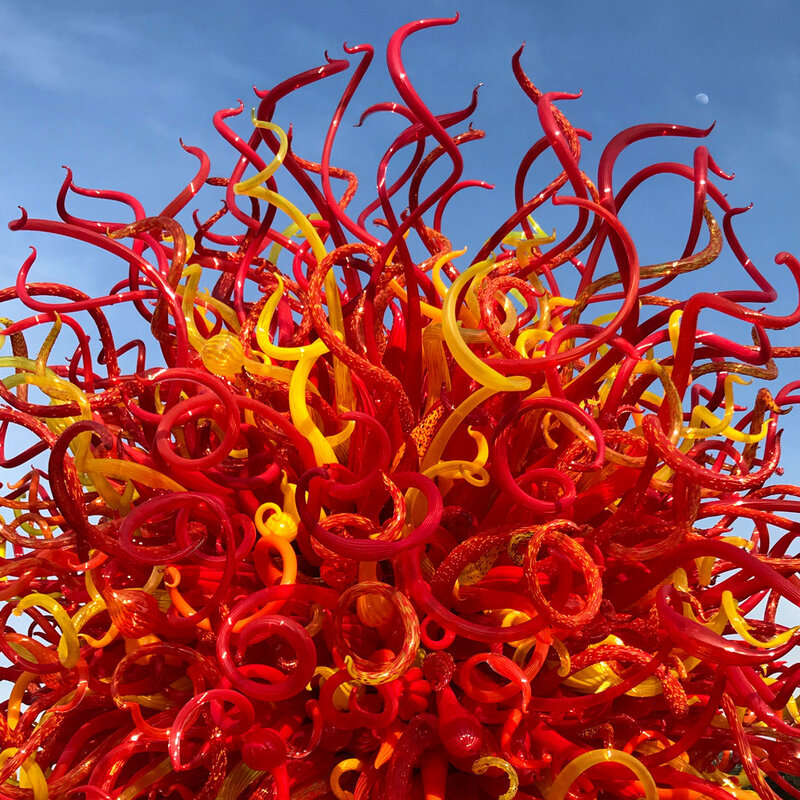 Here, you can watch a film about Chihuly’s creative process. I’ll be returning to the exhibition and look forward to seeing the works illuminated under the evening sky at Chihuly Nights (15 August - 26 October). At age four, I found a garden, living underneath the kitchen floor. It was hiding behind leftover patches of linoleum on the worn-out floor my mother was having removed. The workman was busy when the garden caught my attention. My eyes became glued to the patterns of embroidered roses blooming across my childhood landscape. I saw them and felt a sense of joy and adventure. This excitement felt like a feeling to go forward into something I knew nothing about. My passion and connection to gardening started at that exact moment. When spring arrived, I ran so fast through the house, speeding ahead of my mother's voice. I pulled on my red corduroy jumper and my grey plaid wool hat before my mother could get her jacket on. I catapulted out of the front screen door and threw myself on a fresh carpet of grass. Excited, I bounced to my feet and flipped three more cartwheels before landing by her side. Mother dear was in the garden busy breaking up the soil, and I sat beside her, playing with mud pies in the flower bed. When her work was done, she rewarded me with an ice-cold glass of bittersweet lemonade and then lined my shoes with sprigs of mint to cool off my feet. My mother cooked with the colours and textures of her garden. She baked yams and squash and heirloom tomatoes and carrots. She fed love to a generation of people with purple hull peas and greens. It seems that during my childhood, the blooms from my mother's gardens have healed all the way from her halo to the roots on the soles of our feet. In our last conversation before her death, she encouraged me to go anywhere in the world that would make me happy. Since then, I have planted her gardens through art installations throughout the world, in countries of the people that I meet. Now they're lining parks and courtyards, painted on walls and even in blighted lots off the street. If you were in Berlin, Germany, you would have seen my garden at Stilwerk Design Center, where rosemary and lavender, hydrangea and lemon balm trailed up the glass elevators to all six floors. In 2009, I planted "Philosophers Garden," a garden mural, blooming at the historic Frederick Douglass High School in Memphis, Tennessee. This school’s garden fed an entire community and was honoured by Eleanor Roosevelt during the Great Depression. Again, in 2011, I planted at Court Square Park -- six entry gardens with 80 varieties of deliciously fragrant floribunda and hybrid tea roses. Gardening has taught me that planting and growing a garden is the same process as creating our lives. This process of creation begins in the spring, when you break up the soil and start anew. Then it's time to clear out the dead leaves, debris and roots of the winter. The gardener must then make sure that a good disposition and the proper nutrients are correctly mixed in the soil. Then it's important to aerate the topsoil and leave it loosely packed on the surface. You won't get those beautiful blooms in life until you first do the work just right. When our gardens are balanced with care, we can harvest the beauty of living a life of grace. In the forests, when trees realize through their roots that another tree is sick, they will send a portion of their nutrients to that tree to help them to heal. They never think about what will happen to them or feel vulnerable when they do. When a tree is dying, it releases all of its nutrients to other trees that need it the most. Below the surface, we are all connected by our roots and sharing nutrients with each other. It's only when we come together that we can honestly grow. It's the same for humans in the garden of hardship. In this garden, when the caterpillar transforms into a chrysalis, this involves some struggle. But it's a challenge with a purpose. Without this painful fight to break free from the confines of the cocoon, the newly formed butterfly can't strengthen its wings. Without the battle, the butterfly dies without ever taking flight. My life's work is to illustrate how to integrate human connectivity into the garden. Gardens are full of magical wisdom for this transformation. Mother Nature is creative energy waiting to be born. Gardens are a mirror that cast their own reflection into our waking lives. So nurture your talents and strengths while you appreciate all you've been given. Remain humble to healing. And maintain compassion for others. Cultivate your garden for giving and plant those seeds for the future. The garden is the world living deep inside of you.